Rising out of the chaparral-covered Gabilan Mountains, east of central California"s Salinas Valley, are the spectacular remains of an ancient volcano. Massive monoliths, spires, sheer-walled canyons and talus passages define millions of years of erosion, faulting and tectonic plate movement. Within the monument"s boundaries lie 26,000 acres of diverse wildlands. The monument is renowned for the beauty and variety of its spring wildflowers. A rich diversity of wildlife can be observed throughout the year. 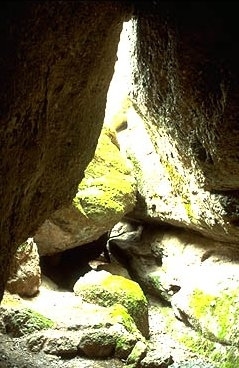 The rock formations of Pinnacles National Monument divide the park into East and West Districts which are connected by trails, but not by a vehicle road. More than 30 miles of trails access geological formations, spectacular vistas and wildland communities. 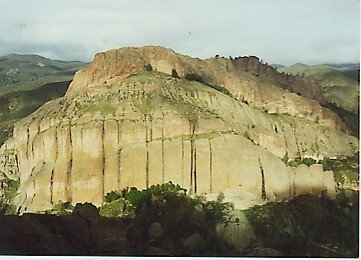 The Pinnacles" rock formations are a popular destination to challenge technical climbers. Pinnacles is a day-use park, with occasional full moon hikes and dark sky astronomical observations led by ranger-interpreters. Hours of Operation: The monument is open every day of the year. East Entrance The east side of the monument is open 24 hours a day. 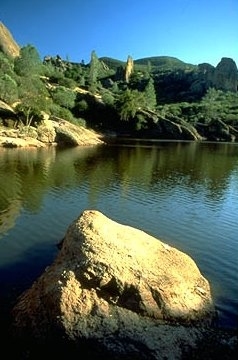 Camping is available at the Pinnacles Campground, which is located near the east entrance of the park. West Entrance An automatic gate at the west entrance of the monument opens each morning at 7:30 and closes each night. Winter hours are now in effect, and the gate closes at 6:00 pm. During daylight savings time, which begins the first Sunday in April, the gate will close at 8:00 pm. Visitors will be able to leave the park after the gate is closed, but cars will not be able to enter. This will allow for late hiking and climbing. Please remember that camping is not allowed on the west side of the park.